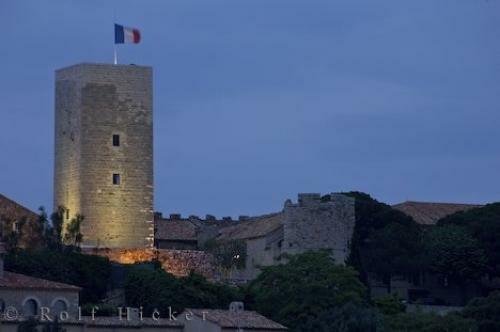 The floodlit Tower Castre, by the Cannes Castle, is home to the interesting Castre Museum in Cannes on the Cote d Azur in Provence, France. Picture of the floodlit Castre Tower and the Cannes Castle in Cannes on the Riviera in Provence, France in Europe. ... Also fine archaeological items and many paintings of the local Mediterranean scenes from the 18th and 19th centuries.Cannes Castle, Castre Tower and Castre Museum in the Old Town, Le Suquet, The Riviera, Cote d'Azur, Provence, France, Europe. I photographed this photo with the digital SLR camera model Canon EOS-1Ds Mark II, aperture of f/13.0, exposure time of 1/2 sec. on ISO 100, as always I used a original Canon Lens, the focus lenght for this picture was 400mm.